Audi Q3 35 TDI Quattro Technology is the top diesel variant in the Q3 lineup and is priced at Rs. 42.88 lakh (ex-showroom, Delhi). This base variant comes with an engine putting out 181bhp@3500-4000rpm and 380Nm@1750-3000rpm of max power and max torque respectively. The gasoline motor comes mated to 7-Speed S-Tronic Automatic transmission which is quite a joy to use. Audi claims an average of 15.2 kmpl for this top 35 TDI Quattro Technology variant. Q. 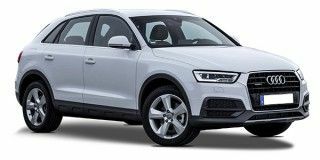 Which is better Audi Q3, BMW X1 and VOLVO XC40? Q. Which is better SUV between Q3 and X1? Q. Which is better CRV or Q3? Audi Q3 will be better pick here in terms of features, safety and performance. Audi Q3 will be a better pick here in terms of features, safety and performance. Q. Which is better between Audi Q3 and Jeep Compass Limited Plus? Q. Jeep Compass or Audi q3 which is better? If you desire to step into the world of German luxury automobiles why settle for a small sedan or a hatch when a compact SUV can be had for less than 10% more? Does the refreshed design, updated heart and increased equipment make the 2015 Audi Q3 an unbeatable package?